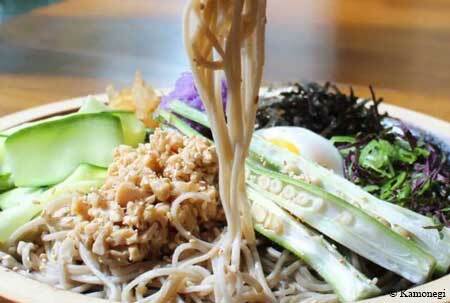 Buckwheat noodles and tempura star on a menu of Japanese specialties. About the restaurant & décor: The entrance to this oddly shaped corner shop faces directly into the kitchen, where diners can spy chef Mutsuko Soma making her signature buckwheat soba noodles. The traditional dish is the highlight of meals in the tiny space, decorated with red trim and Japanese accents and always graced with beautifully arranged flowers. Likes: Handmade noodles, saké list. Food & Drinks: While Soma’s noodles, which she makes by hand daily, are the star, nearly every table starts with the foie gras tofu. Topped with saké-poached shrimp and wasabi, the tiny and elegant bite packs a meal’s worth of flavor, emblematic of the appetizers. The central portion of the menu features the soba noodles, served in dipping style, broth or all mixed up; and tempura, but way beyond the usual sushi shop offerings to comprise eggplant with natto (fermented soy beans), parsnip with truffle salt and beef tongue. Tempura even continues into dessert, with the fried kabocha squash with foie gras ice cream. Drinks include a handful of beers and a few simple red and white wines, but the focus is on saké. Aficionados will be pleased by the range of styles, such as Junmai Daiginjo and barrel-aged options. Servers, well-versed in the nuances, help diners navigate the selection.